Every so often, one type of controversial play seems to endemically occur throughout MLB in a short span of time. This summer, it's catcher/batter/runner contact on a batted ball near home plate—is it obstruction, interference, legal tangle/untangle, or none of the above? 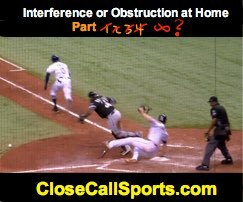 Primer: First, if you haven't yet read our compare-and-contrast article regarding a pair of obstruction (F2 on BR) vs interference (BR on F2) calls, please do so in order to get familiar with the obstruction and interference rules regarding a batted ball hit near home plate. Related Post: Comparison - Infield Interference or Only Obstruction? The Play: That said, here's what we hope will be a terminal discussion on the subject...with a twist. Did F2 obstruct R3 or did R3 interfere w/ F2? The game situation is bottom 8th, one out and one on (R3, the tying run) in Tampa Bay, with Rays batter Mallex Smith at the plate. Smith squared to bunt White Sox pitcher Juan Minaya's 2-1 offering, dropping down a suicide squeeze that, due to Smith's speed, could similarly qualify as a bunt-for-hit situation, in front of home plate as Rays baserunner R3 Joey Wendle sprinted down the line from third base, Wendle making contact with White Sox catcher Omar Narvaez as Narvaez attempted to field the bunt alongside third baseman Yolmer Sanchez and pitcher Minaya, ultimately throwing wildly past first base, which allowed batter-runner Smith to advance to second. Question: Naturally, the question is whether this is obstruction, interference, or incidental/legal contact? Rules: The difference between obstruction and interference is that, "OBSTRUCTION is the act of a fielder who, while not in possession of the ball and not in the act of fielding the ball, impedes the progress of any runner," while, "Offensive interference is an act by the team at bat which interferes with, obstructs, impedes, hinders or confuses any fielder attempting to make a play." Penalties: If obstruction is ruled on the catcher, since this is Type 2/B (no play being made on the obstructed runner), the baserunner from third is awarded home plate. Seeing as he fell on top of home plate immediately following the collision, there's no realistic call to make other than for formalities' sake. 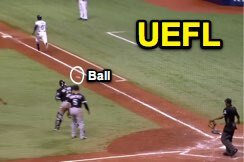 If interference is ruled on the baserunner advancing to home plate, the ball is immediately dead, the runner declared out for interference, and the batter-runner awarded first base (unless the runner's interference is ruled to be an intentional act, in which case the batter-runner shall also be declared out for his teammate's intentional interference [6.01(a) Penalty for Interference Comment]). Analysis: By now, we're very familiar with the "in general" right-of-way rules (If batted ball, then (protected) fielder; else runner). The previous cases we've discussed have all pertained to the batter-runner and a fielder (the catcher), but rest assured, it matters not which runner is involved here...other than in the case of the Armbrister tangle/untangle situation when the batter and catcher have incidental contact while the batter is running to first base and the catcher is attempting to field a batted ball to which he is the sole fielder entitled to protection from the default case of obstruction. No incidental "Armbrister" tangle/untangle exists for any runner other than the batter-runner. How can we best classify this contact? That said, what we have in Tampa Bay is contact that has either clearly hindered the catcher from fielding the batted ball (6.01(a)(10)) or, realistically, nothing, since the would-be-obstructed runner instantaneously fell onto home plate upon his contact with the catcher. For what it's worth, this would be Obstruction Type 2/B if it were to be obstruction, since no play was actively being made on the runner at the time of the collision (imagine, as an extreme example, that the collision prevented the runner from touching home plate, and the defense was able to turn a double play before the runner touched home [e.g., via a missed base appeal]...that's how this is technically obstruction 2, even if it realistically doesn't matter all that much). Recall that the fielder is entitled to field the ball as long as he is the protected fielder (deemed the fielder entitled to protection). Related Post: Protection Question - HS Obstruction on Fielding Catcher (5/22/18). Thus, 6.01(a)(10)'s "the umpire shall determine which fielder is entitled to the benefit of this rule, and shall not declare the runner out for coming in contact with a fielder other than the one the umpire determines to be entitled to field such a ball" clause is all that's needed to officiate this play. It's either interference if the catcher was entitled to field the ball or obstruction (but, realistically, nothing, since the runner fell on top of home plate) if any other fielder was entitled to field the ball. 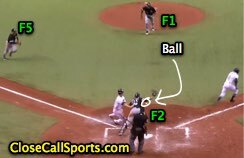 Conclusion: HP Umpire Ramon De Jesus' only call in accordance with the rules would be that, either, A) The third baseman (or pitcher), but NOT the catcher, was entitled to field the batted ball, or, B) the runner's contact with the catcher did not hinder or impede the catcher's attempted play. Gil's Call: I can follow the umpire here as long as he didn't choose option B—the contact clearly impedes the catcher's attempted play...the only question is whether this hindrance was legal, and the only way the hindrance is legal is if the third baseman (or pitcher) was the fielder ruled as the entitled one. Generally speaking, per the batter-runner/catcher Armbrister Tangle/Untangle discussion above, contact between a runner other than batter-runner and fielder on a batted ball is interference or obstruction, but not nothing. Did R3 legally hinder F2's attempted play? How many times have we seen a squeeze play where the third baseman—charging in alongside the runner—scoops and flips the ball to the catcher as the runner slides into home plate. Under this circumstance, the third baseman would be the protected fielder and the catcher's contact with the runner would be ruled obstruction. *Bear in mind, the NCAA ruleset, in 8-5d AR, uses the language "the umpire shall determine which fielder is more likely to make the play and only that fielder is protected": it's not an OBR saying. OBR 6.01(a)(10) and NFHS 8-4-1g use the following: "the umpire shall determine/decide which fielder/one is entitled to...field such a/the ball." Snapshot of fielders at the moment of contact. Tropicana Field's mid-home (press box) camera angle suggests that, at the time of contact between R3 and F2, the catcher was very likely the fielder who would get to the ball first. In NCAA, this is a no-doubter "F2 is protected" situation. Though it takes slightly more massaging relative to rulebook verbiage, I believe F2 should be protected in OBR/NFHS as well. I determined the catcher should be protected after the benefit of multiple replays from multiple angles and a freeze-frame from mid-home that shows precisely where all the fielders were at one split second of the play. That makes it (unintentional) interference. Call "Time," declare R3 out and award BR first base. Point: But no one was covering first! BR Smith would have been safe anyway. Counterpoint: The interference occurred prior to that part of the play. The ball was already dead. See aforementioned penalty, which awards BR Smith first. It just doesn't allow him to take second on a poor throw caused by a teammate (R3)'s interference. In real-time, though, I'm probably expecting a play on the tying run at home plate and, thus, may very well incorrectly protect the third baseman who is charging in from his position, simply based on experience and expectation, in which case this play would possibly get an obstruction point, but no ultimate call other than to keep play alive and allow the batter-runner to reach second on the overthrow. Very tough play for a runner in full-sprint who suddenly has a catcher blocking his access to home plate who, by most accounts, likely has the legal right to temporarily block home plate while he's fielding the ball (this latter fact also explaining, in part, why the plate blocking rule does not apply). But the onus on avoiding hindrance here is on the runner, which makes it a case of interference, however unfortunate it may be.